I wasn't really sure which forum to put this is, as it's not really any of them. I suppose this is the closest. I have my theorys, and know a little more (and I emphasise the word "little") about this, but what do you guys think? I'm interested to get your take. Wow. I just spent some time looking at that site. Sort of a strange mix of Christian, Hindu, and Egyptian beliefs, with a sprinkling of Lewis Carroll. The art is really cool and trippy, though. In fact, the whole site looks like a fantastic acid trip. I suspect the author knows his way around the mental maze pretty well. If you keep going it gets to pages and pages of random technical manuals and stuff, too. I haven't really got time to post a full explaination of what I think is going on at this precises moment, and I don't want to just throw it out there without giving a full answer. Maybe tomorrow. no, I'm not here tomorrow. I think I'll probably be back Thursday or Friday, but it coud be later. Depending on how much time I've got, I'll address this in full when I get back. In the meantime, I'll say that I think it's a very captivating and beautiful site. I really can spend hours looking at it. I am quite curious to know more. Okay, I think that the site is, at least in part, the work of a form of schizophrenia. There's a certain similarity in the way that the site is constructed to the way that schizophrenics see the world, as well as the way that some of the text is written. The artwork, however, is the thing that has the most obvious hallmarks of the schizophrenic. See this page for an exploration of artist Louis Wain's work, first before he had any mental illness, and subsequently as his schizophrenia progressed. Note the eyes of the cats, as well as the interruption of their solid form which gets more progressive as the illness progresses. And that's pretty much it as far as my theories go. 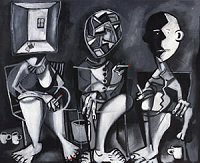 The dissassociative nature of schizophrenia and the loss of ability to distinguish between fantasy and reality (at laest as much as in a mentally healthy person), as well as the styalistic similaritys to writings and paintings done by schizophrenics evident in the site certainly seems to me to be indicative that that's at least a reasonable explaination. FWIW, I've had very, very brief online interaction with the Rob Bell, guy who actually put up the site, and he has said that he's not schizophrenic. However he is, in his own words, "just the webmaster". The guy who was actually responsible for creating the site is David Denison, and Mr. Bell didn't say whether he was schizophrenic one way or the other. [Edited to add]As well as the religions and things mentioned, there's also some of Crowley's work and some ideas used in freemasonry in there. I've always heard that LSD trips are very similar to be schizophrenic. The art on those pages, especially the faces, look just like something someone who was tripping might draw. Well, I've never been schizophrenic (as far as I know), but I have taken acid before. I'd say that there are definate comparisons that could be made between that artwork and the kinds of hallucinations that you can have on acid. It looks to be the work of a magician. In pursuit of a magicians ways...was first warning I received was the possiblity of becoming insane. One slips deep within the psychological abyss of one own mind and plays with unknown powers. The goal of a sorceror is to learn to create a reality on the astral planes..in order to cause an effect on this plane. The restraints of a physical body are absent in the astral realms and what happens within them can lead to utter insanity on this one. After any astral experiences I need to go hiking or do some activity that involves the Earth to become grounded in this reality. The symbology looks similar to what I've seen in other "magicians" book of shadows. Whether the creator of the contents of that site is a magician or sorceror...don't know...but very involved in the pursuit esoteric knowledge. I don't think, David is any sort of schizo, however, David, if you can live w. it, of course I can tell you that I'll seem very happy to find out, if the tachyons really exist, also, why The Corrupt keep on winning: That Museum Piece Fascism Capitalism, peace be w. you all, regards, The Guitt.-tr. I'll tell you, What It was That happened, It was The Year 2018, during which These Motherf. 's made sure that money could exist as a bad compromise, note: God's exist. means nothing to me.